Find out what our experts have to say about Bajaj V! Choose the Bajaj V which fits your bill! Choose the Bajaj V which fits the bill of you. Bajaj V15 is one of the much awaited bikes launched by Bajaj Auto. “V” in Bajaj V15 stands for Vikrant (aircraft carrier warship), and by launching this unique bike bajaj wanted the memory of INS Vikrant live on forever in the heart and mind of every Indian. Bajaj has always been a trendsetter in the indian motorcycle culture by bringing in different types of bikes to the mass market. So, when you gaze the V15 for the first time, you can easily recognise Bajaj’s humble intention to not just celebrate a legend but also to reincarnate an immortal warrior as well. It's not a cruiser, or a scrambler, nor is it a cafe racer, but as per Bajaj it is a “Neo-Classic” design bike. But if you see it more closely, it resembles more to the retro naked category like the BMW R90S, Yamaha SCR, or cause of its multi-purpose tyres a Ducati Scrambler as well. Bajaj V15 is a one of a kind bike as well as versatile performer and competes with the likes of Hero Achiever, Honda CB Unicorn, Yamaha FZ, Suzuki Gixxer and their very own Pulsar 150. 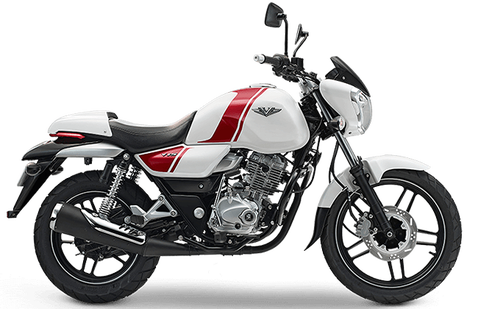 The bike is available in only one variant and as the bike is built for the Indian masses, it is attractively priced at Rs.65,178. In terms of design, the Bajaj V15 is very promising and very well built. Overall fit and finish of this bike is so top notch that it looks much better than some of the bikes in the higher segment. Chrome surround on the headlight gives it a premium look while the entire headlight looks very imposing with the blackened visor, giving the bike a powerful presence. Chiseled tank and the side panels are designed in such a way to give the bike a retro theme. We don't know exactly where the metal of the INS Vikrant is used in the bike nor has Bajaj exactly informed the same. But according to some news sources, a small amount of the warship’s metal is used to construct the fuel tank. Sporty looking 5-twin-spoke alloy wheels looks stunning and increase the design quotient of the bike. The bike comes with the rear seat cowl and when its on the bike, the motorcycle looks like a retro racer. This cowl is of good quality and really enhances the look of the bike. Now the bike also comes with an optional stylish backrest and a prominent “V” logo on the back of it. The retro and classic exhaust muffler not only looks quite unique but also has a different sound compared to the other bikes in Bajaj’s stable. LED taillight on the rear has a jewel effect when it lights up and looks really beautiful with the chrome surround. Seat has a premium texture and is very comfortable to sit on. Going with the classic theme, the instrument console is all analog and gets a speedometer, odometer and a fuel gauge. It is available in Ocean Blue, Heroic Red and Ebony Black colours. Powering the retro bike is the 150 cc air-cooled, single cylinder engine that is integrated with Bajaj’s DTS-i technology. The engine has been engineered to generate a max power of 12PS at 7500rpm and a peak torque of 12.7Nm at 5500rpm. With the DTS-i technology and the level of refinement that has been done to this engine makes it produce a claimed fuel efficiency of 57kmpl. A seamless 5-speed gearbox is mated to this powerful engine that enables smooth gear shifts and allows the rider to attain a max-speed of 109kmph. It has a fuel tank capacity of 13 litres. Seating posture is amazing on the Bajaj V15 with the wide upright handlebars and forward set foot pegs. This seating posture offers a nice, relaxed and a very comfortable feel to the rider. The clutch isn’t hard at all and the gear shifts are very smooth. With a telescopic suspension at the front and gas filled nitrox twin shock absorbers at the rear, the bike soaks up road bumps pretty well. The 240mm disc brake at the front and a rear 130 mm drum brake, do provide good bite and response. Multipurpose 18 inch 90/90 section tubeless tyre at front and a thick 120/80 section covering the 16-inch rims, make the bike go where ever you wish to take it. Safety wise the Bajaj V15 gets an AHO headlamp which makes it safely visible during any time of the day. Petal ventilated disc brake coupled with the wide multi-purpose rear tyre, make safely stopping this bike, a piece of cake. The bike comes with a unique key, which has a hex/allen key attached to it. With this hex/allen key always available on hand you can easily attach or detach the rear seat cowl in a matter of minutes.